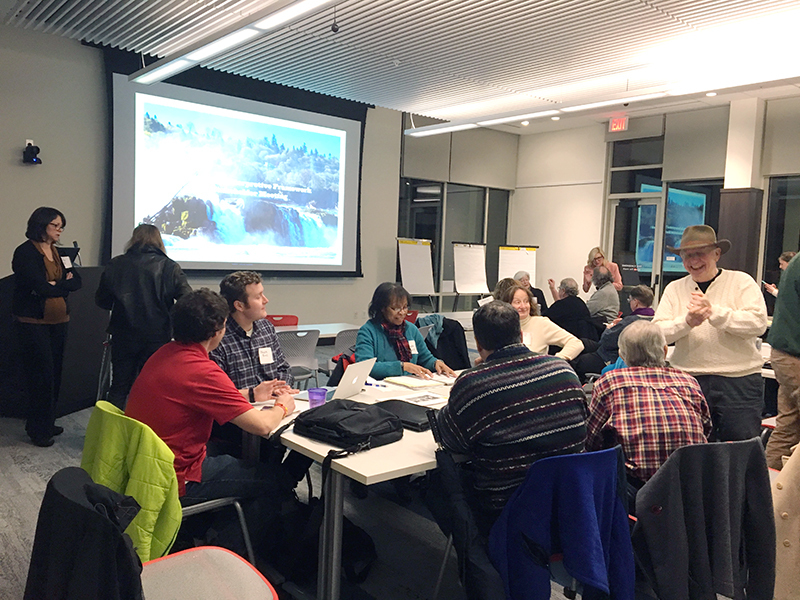 A focus group meeting on the project’s interpretive plan was held on February 22 at the Oregon City Public Library. Many of our community stakeholders have asked how history and culture will be incorporated into the planned riverwalk, which is being designed to create public access to Willamette Falls for the first time in more than 150 years. As one of our four core values, historic and cultural interpretation has been at the heart of project planning from the beginning and will be incorporated into each phase of riverwalk development. The first step with an interpretive framework is to ensure that the site’s history is based on a holistic view of the site and is rooted in primary and secondary resources. This work is currently finishing up through the creation of the Willamette Falls Legacy Project's cultural landscape report, led by Laurie Mathews, Director of Preservation Planning and Design at MIG. A cultural landscape report is a place-based research and planning document that ties information from documents, photographs, illustrations and oral histories to a particular place - and from those sources, focuses on how a place has developed and changed over time. It helps us understand the people and forces that have shaped a place. It also provides glimpses into the character of a place at different moments in time, which is a combination of the natural environment, built environment, and people that manage and live in that environment. The draft cultural landscape report will be ready for review in late spring. Due to overwhelming interest in the Pints from the Past community event featuring the Willamette Falls Legacy Project's cultural landscape report, an encore event will be held on March 14, 2017 at Lake Theater & Cafe in Lake Oswego. Doors open at 6 p.m. and the presentation is from 7-8 p.m. APPROACH: HOW WILL WE TELL THE STORIES? 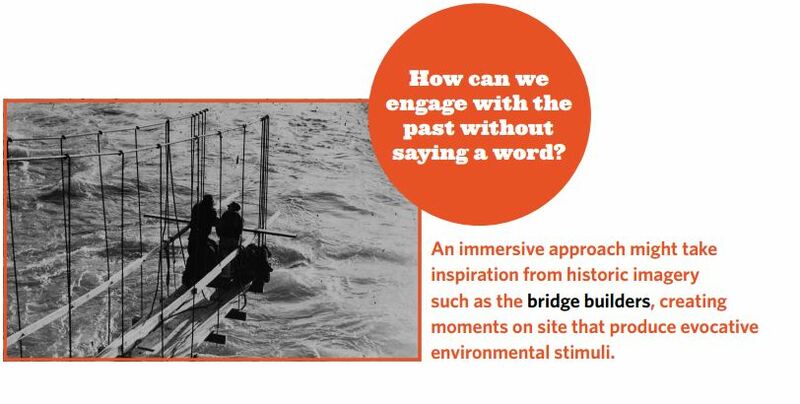 Among the riverwalk project team’s goals are to broaden and deepen its own understanding of the site’s complex history to share with the community, and to tell that complex history to future riverwalk users in interesting and innovative ways. As part of its efforts to reach these goals, the riverwalk project team has chosen three key interpretive design approaches: narration, immersion and re-introduction. Using the narration approach, interpretive content is narrated to visitors, usually through language, whether it is spoken by a docent or guide, or conveyed through text, documented on signage, maps or pamphlets. Using the immersion approach, site elements are allowed to speak for themselves, without narration. With thoughtful design of spatial volume, direction of paths, and manipulation of stimuli, visitor’s senses provide a bodily understanding of scale, temperature, sound, texture, light and shadow. Visitors observe and experience the environment, forming their own meaning in concert with the site. Using the re-introduction approach, lost memories and forgotten histories are reintroduced with careful placement of meaningful objects or materials. An object may be placed back into space in its original form to provide an experience not accessible in the present. Materials may also be reinterpreted to convey complex social topics that have been forgotten or ignored. THEMES: WHAT STORIES WILL WE SHARE? In addition to identifying these key approaches to use in site interpretation, the riverwalk design team also focused on findings from the Willamette Falls Legacy Project’s draft cultural landscape report, which identifies and prioritizes stories of past and current uses of the site that can be told through interpretive elements of the riverwalk. Using the information contained in the draft cultural landscape report and other site research, the team identified five historic and cultural themes: natural history, significance to Native Americans, European immigration, colonization & governance, industry & innovation, and present & future Oregon City. This work will continue to evolve as project phases are realized. 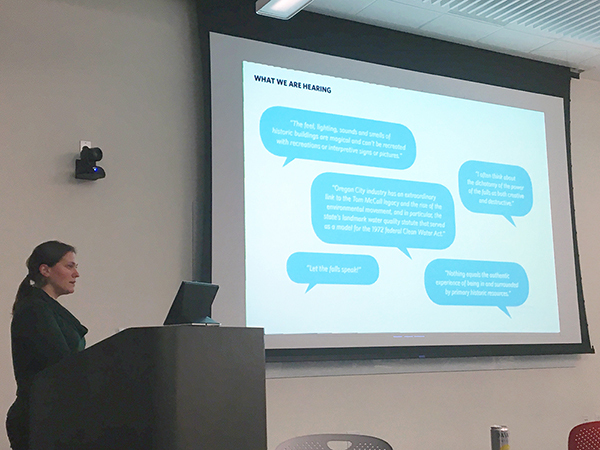 Riverwalk project manager Alex Gilbertson presents findings to focus group participants at the Oregon City Library on February 22. If you are interested in getting involved or receiving more information about the ongoing interpretive planning process, please contact Oregon City Senior Planner Christina Robertson-Gardiner at [email protected].